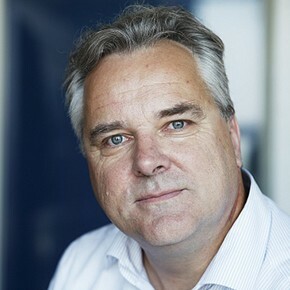 Since July 2004, Nick van de Giesen has held the Van Kuffeler Chair of Water Resources Management of the Faculty of Civil Engineering and Geosciences. He teaches Integrated Water Resources Management (CT4450) and Water Management (CT3011, 2005). His main interests are the modeling of complex water resources systems and the development of science-based decision support systems. The interaction between water systems and their users is the core theme in both his research portfolio and his teaching curriculum. Since 1 April 2009, he is chairman of the Delft Research Initiative Environment. Before coming to Delft University, he worked from 1998 to 2004 at the Center for Development Research of Bonn University, where his main activity was the scientific coordination of the GLOWA Volta Project. From 1994 to 1998, he did Post-Doctoral research on the hydrology and management of inland valleys at WARDA, Cote d’Ivoire. He received his PhD from Cornell University for his work on wetland development in Rwanda. At Wageningen University, he did his MSc in irrigation engineering. Bierkens, MFP, Bell, VA, Burek, P, Chaney, N, Condon, |LE, David, CH, Roo, A. de, Doll, P, Drost, N, Famiglietti, JS, Florke, M, Gochis, DJ, Houser, P, Hut, RW , Keune, J, Kollet, S, Maxwell, RM, Reager, JT, Samaniego, L, Sudicky, E, Sutanudjaja, EH, Giesen, NC van de, Winsemius, HC & Wood, EF (2015). Hyper-resolution global hydrological modelling: what is next? ¿Everywhere and locally relevant¿. Hydrological Processes: an international journal, 29(2), 310-320. Jong, SAP de, Slingerland, JD & Giesen, NC van de (2015). Fiber optic distributed temperature sensing for the determination of air temperature. Atmospheric Measurement Techniques, 8(1), 335-339. Boogaard, FC, Lucke, T, Giesen, NC van de & Ven, FHM van de (2014). Evaluating the infiltration performance of eight dutch permeable pavements using a new full-scale infiltration testing method. Water, 6(7), 2070-2083. Boogaard, FC, Ven, FHM van de, Langeveld, JG & Giesen, NC van de (2014). Stormwater quality characteristics in (Dutch) urban areas and performance of settlement basins. Challenges, 5(1), 112-122. Bruni, G, Reinoso Rondinel, RR, Giesen, NC van de, Clemens, FHLR & Veldhuis, JAE ten (2014). On the sensitivity of urban hydrodynamic modelling to rainfall spatial and temporal resolution. Hydrology and Earth System Sciences Discussions, 11(6), 5991-6033.